In their first game and only game of the Rocky Mountain Athletic Conference Tournament, No. 6 seed UCCS went head to head with No. 3 seed Regis University. This was the sixth consecutive year that UCCS has qualified for the RMAC Tournament. The first half started off slow for the men. The score stayed at 7-6 in favor of UCCS for a span of four minutes, with neither team making a basket. The Rangers took a 21-9 lead midway through the half, thanks to an 11-0 run. By halftime, UCCS had cut that lead down to three points. UCCS junior Padiet Wang had 11 points in the first half while he playing guard.. Regis senior Jarrett Brodbeck matched him with 10 points in the same span of time. UCCS grabbed their second lead of the game seven minutes into the second half, thanks to a three-pointer from senior Elijah Ross, making the score 50-49 with 13:16 left to play in regulation..
Redshirt junior, Blend Avdili, added two three-pointers a few minutes later to give the Mountain Lions a 58-56 lead, but Brodbeck answered back with a three of his own. A basket by redshirt senior Dalton Walker and a three by Wang tied the game at 64 apiece with seven minutes left to play. UCCS drew within one point twice in the final minute thanks to Avdili, who drained another three and nailed two free throws. The Rangers locked down defensively, preventing UCCS from getting off a shot to potentially tie the game. Turnovers proved to be an issue for UCCS, with the Mountain Lions committing nine in the second half alone, and Regis scored 20 of their points off of turnovers. While the Mountain Lions caught fire from the three-point line in the second half (7-9), they were outscored heavily in the paint throughout the game. 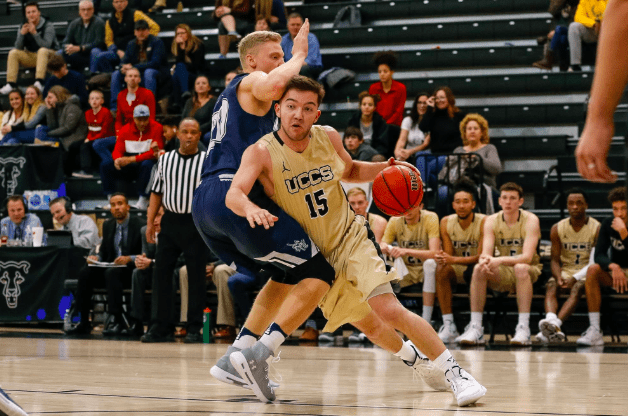 Both teams shot 50 percent for the night, but while UCCS managed 25 of 50 shots, Regis slightly outpaced the Mountain Lions, scoring 29 of their 58 shots. Wang led UCCS in scoring with 18 points, 5 rebounds and 5 assists. Avdili finished with 13 points, and nine of those came from behind the arc. For the Rangers, Brodbeck had 22 points in the game, with 15 of them coming from three-pointers. Junior Christian Little and freshman Toni Rocak also chipped in for Regis, with 20 points and 16 points apiece. This loss ended the men’s basketball season for the Mountain Lions, with their overall record finishing at 17-12. With the season now over, the four seniors including Elijah Ross, Dalton Walker, Ian MacDonald and Brandon Malone, have now all played their final game for the Mountain Lions. Ross finishes his college career as the second Mountain Lion in recent years to surpass 1,000 career points, a milestone he hit toward the end of this season, in a game on Feb. 23 against Black Hills State University. Ross played for four seasons at UCCS. Walker scored 30 points earlier this season against CSU-Pueblo, tying his career-high for points scored in a game, and is also second on the team and No. 21 in the RMAC in points scored during this season. Walker was also named to the 2018-19 All-RMAC Second Team, along with Wang and Avdili. Walker played for four seasons. MacDonald notched season-highs in both points (17) and rebounds (8) against New Mexico Highlands. MacDonald also played for four seasons at UCCS. Before suffering a knee injury earlier this season, Malone averaged 11.2 points per game and shot 41 percent from the three-point line. Malone played for four seasons.